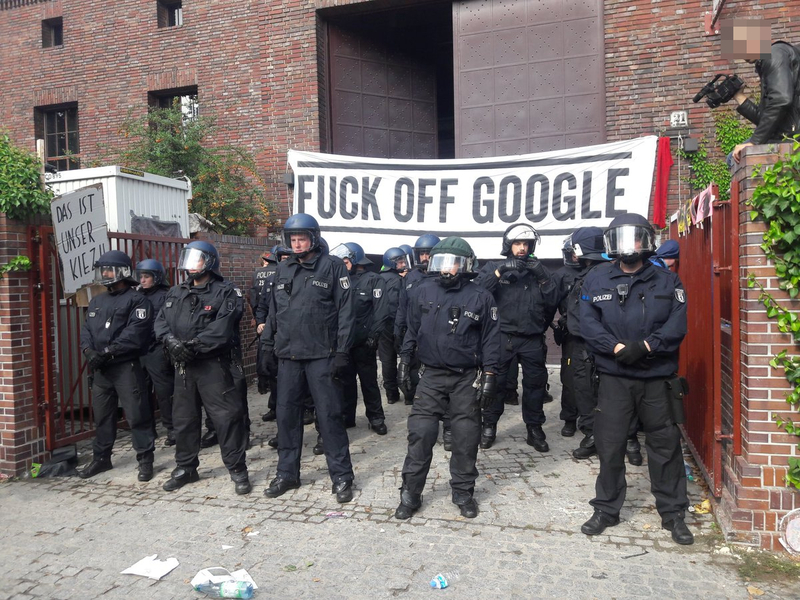 Berlin, September 7: Activists occupied the Umspannwerk in Berlin’s Kreuzberg district earlier today to prevent the planned Google Campus there. After about 2 hours riot cops evicted the building. Here is a statement by the squatters, the statement was released before the cops evicted the building earlier this afternoon. Six people were detained during the eviction. Today we occupied the Umspannwerk in Kreuzberg to prevent the planned Google Campus there, to fight against the skyrocketing rents and to open up the space for something better. The Google Campus is intended to be a magnet for annoying young entrepreneurs whose IT-sweatshops (“start-ups”) promise to deliver new ideas to Google’s company business. New tech companies are driving the rents up in the area higher and higher. The endpoint of this process can be seen in San Francisco, which once must have been a halfway livable city. While it is especially aggravating that Google, despite its aggressive collection of data, is morphing into Big Brother with a user-friendly face, this is not the decisive factor for us. We would also put a spoke in the wheel of any other company. What happens now in the Umspannwerk instead depends on everyone who fills the house with life. It could become a base for the many initiatives that are currently struggling against rising rents and displacement – a campus of subversion. But it can also be used as a covered grill area for the cold months, or something more. We call on all rebellious tenants, subversive and precarious cultural workers, work-shy benefit scroungers, strike-hungry air traffic controllers, long-living pensioners, unruly refugees, and all other local pests from the neighborhood (and beyond) to join us in the occupation as quickly as possible. A neighborhood assembly will take place at 6 p.m. to discuss the occupation and how to proceed. Get involved! We expect an announcement from the top management that Google immediately and irrevocably withdraws from the Kreuzberg Umspannwerk. The assembly will take place at 6 p.m. to discuss the next steps and the sensible use of the premises. If it comes to eviction, we’ll see each other again very soon, on the Campus or elsewhere – as we wander around together and take the city for ourselves. At 18:00 (06:00pm) there will be a gathering in front of the evicted building. Previous post: #Hambacher Forest: Day X is here! How do I become active?